ایرانی‌‌مهر, محمد, ریاحی, محمدعلی. (1393). تضعیف نوفه تصادفی با تبدیل موجک گسسته ضریب اتساع گویا. مجله ژئوفیزیک ایران, 8(3), -. محمد ایرانی‌‌مهر; محمدعلی ریاحی. "تضعیف نوفه تصادفی با تبدیل موجک گسسته ضریب اتساع گویا". مجله ژئوفیزیک ایران, 8, 3, 1393, -. ایرانی‌‌مهر, محمد, ریاحی, محمدعلی. (1393). 'تضعیف نوفه تصادفی با تبدیل موجک گسسته ضریب اتساع گویا', مجله ژئوفیزیک ایران, 8(3), pp. -. ایرانی‌‌مهر, محمد, ریاحی, محمدعلی. تضعیف نوفه تصادفی با تبدیل موجک گسسته ضریب اتساع گویا. 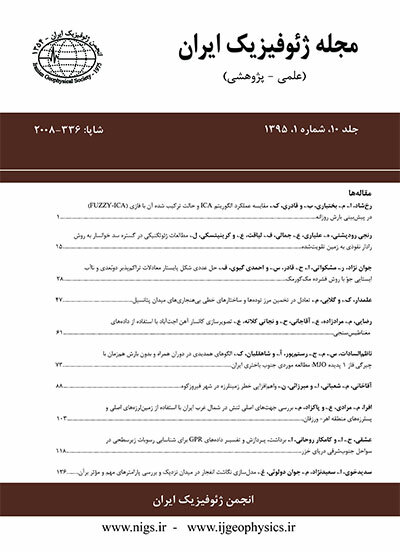 مجله ژئوفیزیک ایران, 1393; 8(3): -. هدف از اجرای عملیات ژئوفیزیکی تشخیص پدیده‌‌های زیر زمین با بیشترین دقت ممکن است. ثبتنوفهدربرداشتداده‌‌های لرزه‌‌ای اجتناب­ناپذیراست. نوفه‌‌های گوناگونیداده‌‌های لرزهراتحت‌‌تاثیرقرارمی‌‌دهند،ازمهم‌ترینآنهانوفهتصادفی است کهازحرکتنوسانی بی‌‌نظمذراتدرهنگامداده‌برداریحاصل می‌شود. نوفهتصادفیدرهمهزمان‌‌ها ودرهمهبسامد‌‌ها حضورداردوکیفیتداده‌‌های لرزه‌‌ای راکاهشمی‌دهد. به‌‌منظور رسیدن به تفسیر قابل‌‌اعتماد، ژئوفیزیک‌دانان سعی بر رسیدن به داده‌‌ای با کمترین نوفه تصادفی و همدوس دارند. درسال‌‌های اخیرتبدیلموجکگسستهدرحکمگزینهمناسبیدرامرپردازشسیگنالمعرفیشدهاست. دراینتحقیقازتبدیلجدید موجکگسسته ضریب اتساع گویا، باقابلیتبهبودتفکیک‌پذیریزمانی- بسامدیبرای تضعیف نوفهتصادفیاستفادهشده است.تبدیل موجک ضریب اتساع گویا دارای قابلیت به‌دست آوردن محدوده‌‌ای از ضریب‌‌ کیفیت‌‌ها است.در این تبدیل کاربر می‌تواند با تغییر چند متغیر به ضریب‌‌ کیفیت مناسب برای پردازش داده دست یابد. این تبدیل با انتخاب ضریب‌‌ کیفیت مناسب، با توجه به نوع داده، بهتر می‌تواند سیگنال را تجزیه کند و نسبت به تبدیل موجک گسسته معمولی با ضریب‌‌ کیفیت ثابت، نتایج بهتری به‌دست آورد.درمرحلهبعدبااستفادهازآستانه‌گیرینرمیا سایر آستانه‌گیری‌‌های مجاز،امکان جدا‌سازی نوفهازسیگنالمیسر می‌‌شود. تبدیل موجک جدید روی داده مصنوعی با سطح نوفه‌‌های تصادفی متفاوت و همچنین داده واقعی از نوع داده دریایی با محتوای بسامدی زیاد اِعمال شدو نتایج حاصل با نتایج تضعیف نوفه تصادفی با تبدیل موجک گسسته دوتایی مورد مقایسه قرار گرفت. The purpose of the geophysical activity is to recognize the underlying phenomena with a precision as high as possible. The record of noise in seismic data is inevitable. Different noises affect seismic data among which random noise is one of the most important ones, resulting from random oscillation of particles during the sampling. Random noise is present at all times and all frequencies; it decreases the seismic data quality. To achieve a trustworthy interpretation, geophysicists try to prepare data with the least random and coherent noise. There are many methods for analyzing seismic signals. In recent years, discrete wavelet transform has been introduced as a suitable choice in seismic signal processing. Bayram and Selesnick (2009) developed a family of wavelets transforms, which have a wide range of the Q-factor(in bandpass filters,Q-factor is defined as wavelet centre frequency/bandwidth). This research has tested the rational dilation wavelet transform (RDWT) with enhanced time-frequency discrimination. In this research the rational dilation wavelet transform was used for random noise attenuation from synthetic and real seismic data. The capability to apply differentQ-factors is the main advantage of the RDWT compared to the dyadic DWT. This transform overcame the limitation of conventional wavelet transform with a constant quality factor. Â Â Â This method is robust in the task of de-noising with fewer signal distortion effects because of its ability to choose an appropriate Q-factor and the degree of over-completeness.These WTs provide a rich range of redundancy andQ-factors. Moreover, the RDWT used in this study is based on rational (non-dyadic) dilation and attains over-completeness by increasing sampling in both time and frequency (Bayram and Selesnick, 2009).The RMS error is a measurement of the differences between values of a trace after an RDWT inverse transform without any de-noising and the input trace shown in Table 1 of the present article. Â Â Â The capability to apply differentQ-factors let the user choose the appropriate Q-factor and desired frequency and time resolution. The user can choose appropriate Q-factor setting some parameters (p, q, s, j),wherein âq/p'is the dilation factor and âsâis the sampling factor of the high-pass filter and the number of processing levels is determined by â jâ. These parameters must be chosen such that the time frequency representation of each level of decomposition will be enhanced. In an earlier work, this method was used with the purpose of ground roll attenuation (Iranimehr et al., 2013). Â Â Â Using the appropriate quality factor according to data type, the used wavelet will match well with the seismic signal and the signal obtains a large amount of wavelet coefficients but the undesirable random noise would attainsmall amount of wavelet coefficients. Â Â Â In the next step, noise was separated from signal using soft thresholding or other authorized thresholding methods. The wavelet transform was applied to synthetic data with different noise levels and a real marine data with high frequency content and the results of the random noise attenuation were compared with the dyadic wavelet transform. Table 2 of the present article compares the results of random noise attenuation by dyadic discrete wavelet transform and rational dilation wavelet transform by different type threshold.